A wedding is a celebration to cherish. That’s why the preparation matters. If you want to send out unique wedding invitations, here are 7 ideas. Did you know there were 112,954 marriages in Australia during 2017? Weddings are more than just a celebration of love. They provide family and friends with an opportunity to meet for the first time or reconnect after years of being apart. Your guest’s wedding experience begins from the moment they open their invitation. The style of your invitations will set the tone for the rest of the wedding journey. Do you want to get guests excited about your special day? Creative, attention-grabbing invites are the perfect way to create a buzz. Read on to learn how to captivate your guests with unique wedding invitations. The average wedding can end up costing close to $34,000 or more. To avoid going over budget, spend some time researching different price points for invitations. Adding colour to your wedding invitations is an easy, non-expensive way to bring them to life. Do you want to tell the world how powerful your love is? The colour red expresses strength and confidence. Excite your guests with a passionate red colour scheme that announces your wedding date. The colour orange can give people a feeling of happiness and peace. The warm, inviting colour does a great job at making people feel welcomed. Your guests will feel you welcoming them from the moment they open the envelope. If you aim to please then green is the right choice for you. The colour green is a pleasing colour that promotes peace and a sense of refreshment. Guests will know them in for a revitalising experience when they go to your wedding. Your invitations could be your something blue to make your wedding complete. The colour blue causes feelings of deep relaxation and peace. Lull guests into a state of relaxation as they daydream about the special day. If calming blue isn’t your style, you can wow your guests using a blend of metallic colours. After choosing you’re all done choosing the colours, you’ll be ready to start searching for designs. You can also create custom designs that have the exact look you’re after. Unique wedding invites are the ones that think outside of the box. Instead, of using traditional inserts, try using a variety of geometric shapes. One of your inserts can be a triangle, while another one could be a circle. Try sprinkling in a few polygon shapes too to make the attention-grabbing effect complete. The differently shaped pieces of the invitation will be a pleasant discovery for your guests. If you’re only sending invitations to close family and friends you could also add photos. The photo collage invitation, along with its special inserts, will become keepsakes for guests to cherish over the years. Where is your wedding taking place? A theme can help inspire a multitude of wedding invitation ideas. 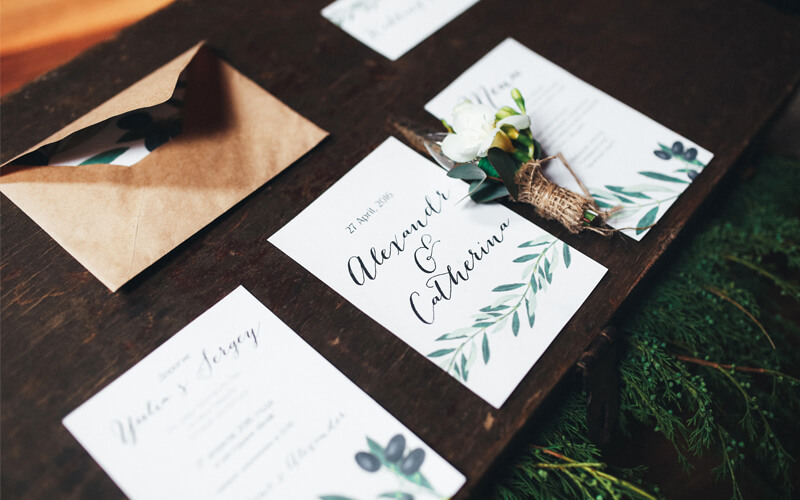 Animal and plant lovers can use their outdoor wedding to create a nature theme for their invitations. If your an animal lover whose wedding is taking place outdoors try creating a wildlife guide. Gather a few photographs of native plants and animals in your area. Or to add a children’s storybook feel, see if you can find illustrations of the animals and plants, instead of actual photos. Next, write down the animal and plant names, along with a few fun facts. Alongside each illustration of a plant or animal, you can have 1-2 sentences that include the animal’s or plants, name and fun fact. Guests of all ages will love having their very own guide to the local wildlife. Tree’s are another way to reference the outdoor theme. Start, by choosing a colour scheme for your invitations that reflect nature. Colours of green and orange would work perfectly for this. The colours you choose can create the background of the invitation, along with the lettering. After choosing your colours you’ll want to find an image of a tree. On the main invitation have a picture or illustration of your favourite tree. Alongside the tree, you can add the wording for your wedding invitation. Finally, have some of your inserts be in the shape of a leaf. After selecting your unique wedding invitations, it’s time to print them up! Always go with a high-quality printing service to complete your finished product. Poor quality paper and messy print jobs will only steal away from your invitations message. Here at Island Printing, we specialise in digital printing. We can help you craft any look you want by using the highest standard equipment in the industry. All of your images, lettering, and formatting will look crisp and clear. We promise to never send out any invitations that aren’t absolutely perfect. If you need help creating your design, we’ve got you covered. Our expertise in graphic design will help us make eye-catching invitations that will blow your guests away. Start your wedding off the right way. Contact us today to receive your free wedding invitation quote.